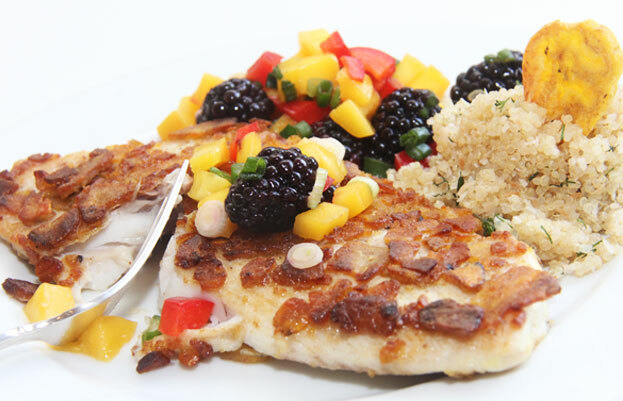 You can use any firm fleshed white fish like grouper or halibut instead of snapper for this easy and delicious recipe. The crushed plantain chips give a great coating and provide a real crunch depending on how finely you grind them. Serve with Blackberry-Mango Salsa and Quinoa made with sauteed garlic, onion and toasted coconut for a wonderful dinner. This recipe doubles, triples or quadruples easily. Beat egg with salt and pepper in a shallow dish. Set aside. Pour plantain crumbs into other shallow dish. Rinse fillets and pat them dry. Dip fillets in crumbs, then in egg and then again in crumbs. Set aside. Pour oil in skillet and heat over medium flame. Carefully, slip fish into hot oil. Saute 4 minutes on one side before slowly turning them over and browning on the other side. Remove fillets with spatula and drain on paper towels. Serve hot or at room temperature.